In a 1967 article titled “The Art of Directed Opportunism,” Martin Goland proclaimed that “once the decision has been made to move ahead in a particular direction, the effort cannot be half-hearted.” The words of SwRI’s second president still ring true 50 years later and are the driving force for a team of engineers who launched the Institute’s unmanned systems program a decade ago. Ryan D. Lamm, director of SwRI’s Applied Sensing Department, climbs aboard the largest vehicle in SwRI’s unmanned fleet. With over 19 years of experience, Lamm leads the department in its development of intelligent network systems, cooperative systems, embedded sensing networks, and unmanned systems. The Mobile Autonomous Robotics Technology Initiative (MARTI) — its acronym a nod to Martin Goland — began in 2006 with a $4 million investment from SwRI’s internal research program. It sought to develop unmanned ground vehicle (UGV) technology for the autonomous control of tactical and combat military ground vehicles, passenger cars, commercial trucks, industrial tractors, and mobile robots. Far from half-hearted, the MARTI program has strategically positioned the Institute as a leader in unmanned systems technology. Now approaching $60 million in external project funding, the program has resulted in a vibrant, sustainable business for the Institute. By weaving together SwRI’s vast capabilities into a “mosaic of grander design,” the Institute is now an internationally recognized solutions provider of active safety, automated driving systems, and UGVs. MARTI began as a collaborative effort among five technical divisions. More than 100 SwRI staff spent more than 32,000 project hours during its startup years from 2006 to 2011. In all, SwRI has automated 15 types of vehicles, ranging from golf carts and SUVs to Class 8 tractor trailers. Automated driving systems have been deployed in seven countries on four continents, including two UGVs in Afghanistan in 2014. In November 2008, SwRI demonstrated its first automated vehicle, known as MARTI, on the streets of New York City as part of the ITS World Congress. The program began with a handful of engineers tinkering with a used sport utility vehicle in a corner of a small lab at SwRI’s San Antonio headquarters. The program has since grown to a fleet of over 20 automated vehicles piloting themselves around SwRI facilities, both on and off road. This bustle of activity involves multidisciplinary teams of engineers and analysts performing leading-edge research and development in a 20,000-square-foot facility. SwRI serves a full range of clients, including original equipment manufacturers as well as other automotive, agriculture, construction, and defense companies. The program is continually expanding, to encompass the U.S. Army, Navy, and Marine Corps as well as foreign ministries of defense. Plans are underway to add more labs and vehicle bays to support future growth. 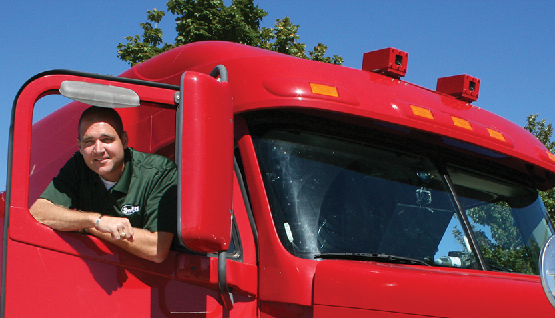 The MARTI program initially researched the current state of the art in automated vehicle technology in the commercial vehicle realm. Within the first six months, engineers identified and installed a set of prototype sensors and computational hardware, developed extensive vehicle dynamic models to optimize control, established rudimentary software to drive the vehicle, and optimized near-real-time control algorithms. This technology allowed research vehicles to follow a dense set of waypoints, traveling at over 30 miles an hour around a test track without human intervention. Within its first year, SwRI’s automated vehicle could avoid obstacles — both static and dynamic — without human intervention. Within 18 months, the vehicle could negotiate intersections in mixed traffic, obeying general traffic laws. And in November 2008, SwRI publicly demonstrated MARTI technology on the streets of New York City. During its Big Apple debut, SwRI’s first automated vehicle successfully negotiated intersections, interacted with other manned and unmanned vehicles, avoided dynamic obstacles such as vehicles and pedestrians, and coordinated maneuvers with other vehicles and roadway infrastructure such as traffic signals. Simultaneous to the technology development, SwRI formed relationships with the commercial auto industry. Unfortunately, just as SwRI unveiled the technology in New York City, an automotive industry crisis began as part of a global financial downturn. During the downturn, with the help of the Institute’s Business Development Office, SwRI pivoted emphasis from commercial to military systems. Engineers also looked for ways to combine the MARTI technology with connected vehicle technology being developed to support intelligent transportation systems on public roads. At the 2009 Robotics Rodeo — a showcase of military robotics technology at Fort Hood in Killeen, Texas — SwRI used the MARTI vehicle platform to demonstrate how a UGV can reliably support military multi-vehicle convoy operations. Connecting unmanned aerial systems — drones — with unmanned ground vehicles provides more global information about the surrounding environ-ment. This sort of unmanned technology can help remove humans from particularly hazardous duties. In cooperation with the U.S. military, SwRI deployed two fully automated tactical vehicles to Afghanistan to assess how this technology could support ground troops in the battlefield. SwRI’s UGV technology is modular, which allowed engineers to rapidly adapt it for military applications. For example, a convoy could instruct a UGV to “lead upon command” and “follow where appropriate.” The UGV could operate in various formations, navigate an urban environment, lead the convoy, and fall back into formation upon command. The UGV could also rapidly be switched from human operation to fully autonomous modes. As a result of the demonstration, SwRI began a project with the U.S. Navy to develop unmanned vehicle algorithms and platforms using low-cost vision technology. The Small Unit Mobility Enhancement Technology (SUMET) program, funded by the Office of Naval Research, implemented all-terrain navigation using a vehicle outfitted with only camera-based sensors. The SUMET program achieved reliable automated vehicle operation in austere, harsh, off-road environments without depending on global positioning system (GPS) technology. SUMET achieved this by using multi-spectral electro-optical perception and advanced path-planning algorithms. SwRI demonstrated the SUMET platform multiple times in various off-road scenarios. The UGV could detect and avoid pedestrians and natural and man-made obstacles. 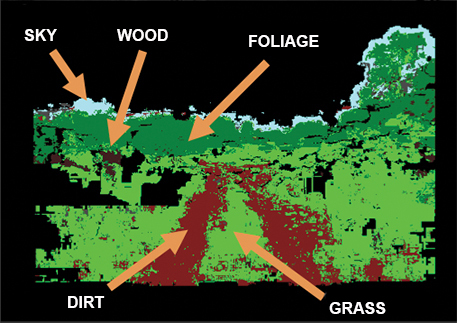 The sensor suite could distinguish between different terrains, such as dirt, rock, asphalt, grass, wood, and foliage. In 2012, the U.S. Army TARDEC (Tank Automotive Research, Development and Engineering Center) used the SUMET code to initiate its Dismounted Soldier Autonomy Tools (DSAT) program. For DSAT, SwRI worked with TARDEC engineers to add new sensing modalities and a more modular framework. With these advances, engineers could create, implement, and share new fully automated behaviors on multiple tactical vehicle platforms. Since DSAT was deployed in Afghanistan in spring 2014, the Army has used DSAT code in its Robotics Technology Kernel (RTK) and to develop new automated capabilities. 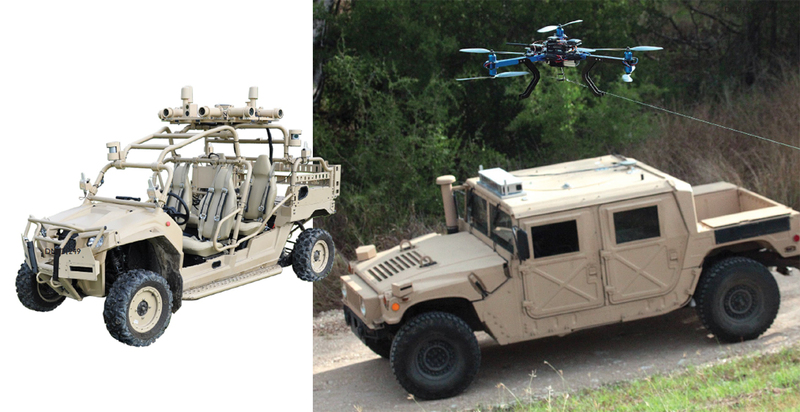 SwRI developed gesture recog nition capabilities for unmanned vehicles used in military, highway work convoy, and other applications. Image-processing algorithms identify and distinguish diff erent arm gestures from a designated pedestrian to give commands that allow more natural, efficient inter action with an automated vehicle. As the automotive industry started recovering in 2010, SwRI began working with the commercial entities, road operators, and various departments of transportation as well as agriculture and mining companies. Engineers began to see how modular MARTI algorithms such as road curvature detection, automated truck-mounted attenuators, and human identification and tracking safety systems could be adapted for various mobile tractors and equipment. Commercial companies in Japan and Europe were among the first to recognize the benefits of the SwRI-developed component technology. 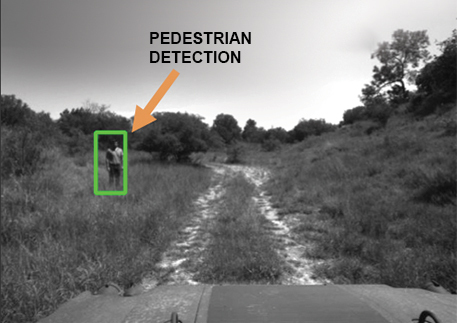 SwRI’s unmanned vehicles use a low-cost sensor suite and sophisticated software to identify pedestrians and distinguish between terrains, such as dirt, roadway, grass, and sky. Today, various automotive manufacturers and tier one suppliers are using SwRI algorithms and technology in their automation research and development programs. This technology includes the 2015 R&D100 award-winning Ranger localization system as well as state-of-the-art environment classification and object detection systems. give unmanned systems the ability to understand their environment, localize their position to within centimeters, navigate roadways and off-road terrain, and perform a full range of specialized applications. Now more than ever, the media and public are fascinated by automated driving systems. While the technology is making its way from industrial and military applications to consumer vehicles, it still will be some time before all of us will be driven to and from work by an automated vehicle. In the meantime, SwRI will be at the forefront of this technology, developing state-of-the-art solutions for industrial, commercial, and government clients. Questions about this article? Contact Ryan Lamm via email or call +1 210 522 5350. 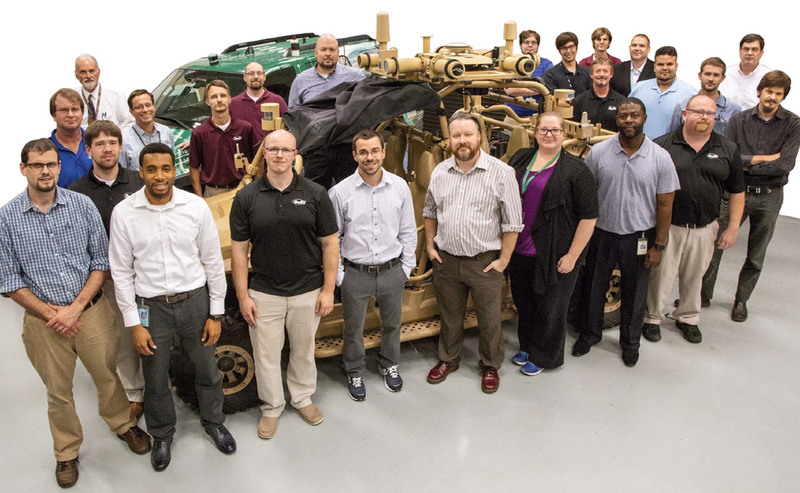 In 2016, a team of more than 25 analysts and engineers are engaged in SwRI’s automated vehicle program, working on driverless technology for a wide range of military and commercial applications.